I had the privilege of travelling overseas and visiting several cities in my previous job, including Los Angeles, Boston, Baltimore, New York, Venice, Frankfurt, Essen, Seoul and Beijing. They were mostly study trips that involved architecture and urban planning studies, or visits to significant events like the Venice Biennale which you might have read in my earlier post: (http://aikkianphotography.blogspot.sg/2014/06/venice-biennale-essen-germany.html). Together with colleagues from the Economic Development Board (EDB) of Singapore, we made a trip to Seoul and Beijing, visiting art galleries, museums and art-related developments there. Despite being a short trip, it was an eye-opening experience and enlightening lesson for me in the fascinating world of contemporary art. This was my first trip to Seoul and looking out of my hotel window onto the streets after I've checked-in, trying to figure out the Hangul on the tarmac. I loved this city so much and had returned shortly for my own holiday (http://aikkianphotography.blogspot.sg/2015/01/a-week-of-holler-and-makgeolli.html). Interesting and immaculate road markings at a junction. Quite mesmerising to watch vehicles ballet around the intersection from my hotel room. Stayed with Lotte Hotel, Seoul. Good location, great views. Visited The Trinity Place which houses several art galleries. There are plenty of interesting cafes and restaurants in Seoul, with some tucked in their traditional houses. Walked past numerous "café buildings". Simple, sleek and elegant structures set in peace and serenity to enjoy your coffee. After walking for hours and visiting a few galleries, it was finally time for a nice cup of coffee. Many new and contemporary art-related establishments could be seen along the streets, juxtaposing the traditional Hanok. Quaint and independant cafes are a common sight at every corner along the back alleys. Visited the Gana Art Center located at Pyeongchang-dong, a quiet residential area well-known for its cluster of art galleries. It was designed by French architect, Jean-Michel Wilmotte who also designed Incheon International Airport. The Gana Art Center, which also houses the Gana Art Auction House. ONE AND J. Gallery - a local gallery which focuses on young contemporary Korean artists. No one could possibly miss the big, bright yellow pumpkin by Yayoi Kusama at the entrance. Details on the ONE AND J. building. An elegant and very well-designed and detailed building. Signage of ONE AND J. Gallery along the side of the building, leading to the main door. Visited Seomi Gallery, another renowned and respectable contemporary art and design gallery. Beautiful contrast between the old and the new. Visited the Leeum Samsung Museum of Art. The mega complex combining three buildings were designed by internationally renowned architects Mario Botta, Jean Nouvel and Rem Koolhaas. The Museum carries a vast and interesting collection of both Korean and international art. The Museum building facade with a giant cone installation. The iconic sculpture - Maman by Louise Bourgeois. A massive sculpture of spider on the roof deck of Leeum Samsung Museum. Rem Koolhaas (foreground) in conversation with Mario Botta (background). My colleagues entering the Leeum Samsung Museum of Art. Interior of Rem Koolhaas's Samsung Child Education & Culture Center. Interior of Mario Botta's Museum 1 building. Was pleasantly surprised by this gorgeous sight of cherry blossom outside the Museum. Another coffee stop at a beautiful café. I had lost count how many cups of coffee we had everyday during our trip. A café with nice coffee, nice ambience, and nice people. Established in 1982, Kukje Gallery is a leading venue for international exhibitions of world renowned contemporary artists. The famous shopping street of Apgujeong-ro. It was a business trip and so, no, we didn't stop and shop. Visited the vibrant street of Garosu-gil in Sinsa-dong. Nice cafés along Garosu-gil. We were spoilt for choice. Settled down at a café for another cup of coffee along the sidewalk of Garosu-gil. A wonderful way to unwind at the end of the day while man-watching the beautiful people of Seoul. Mouth-watering army stew for dinner at Myeongdong. The kaleidoscopic streetscape of Myeongdong. Although most stores and merchandise had nothing close to my needs or interests, it was still highly exciting to explore Myeongdong from street to street, shop to shop. All photos taken with Samsung NX mirrorless system. My art lesson had moved from the Korean to the Chinese Capital on the 4th day. With no time to waste, we went straight to Caochangdi (草场地) directly from Beijing International Airport. No, that wasn't our car. We didn't take a Ferrari to Caochangdi from the airport. That would have belonged to an art gallery owner or any art collector, easily. Caochangdi is a renowned arts district northeast of Beijing. Nestled in a sleepy village, these monochromatic rectilinear buildings house the most colourful and vibrant contemporary art studios, including of Ai Weiwei's. Inside an art gallery and exhibition space in Caochangdi. While most people might not have heard of Caochangdi, Beijing 798 should definitely ring a bell, even for those who have never heard of Ai Weiwei. The ambience and street energy from both places were worlds apart. After all, 798 has become a must-go tourist attraction in Beijing. There are so many art galleries in 798 that you cannot possibly finish visiting them all in a day. Visited the Ullens Center for Contemporary Art (UCCA), a not-for-profit global contemporary art centre located in 798. Opened in 2007, it was founded by Belgian art collector baron Guy Ullens and his wife. The massive 12m high exhibition hall at Galleria Continua. Featuring "Stairway to Heaven" by Kendell Geers. 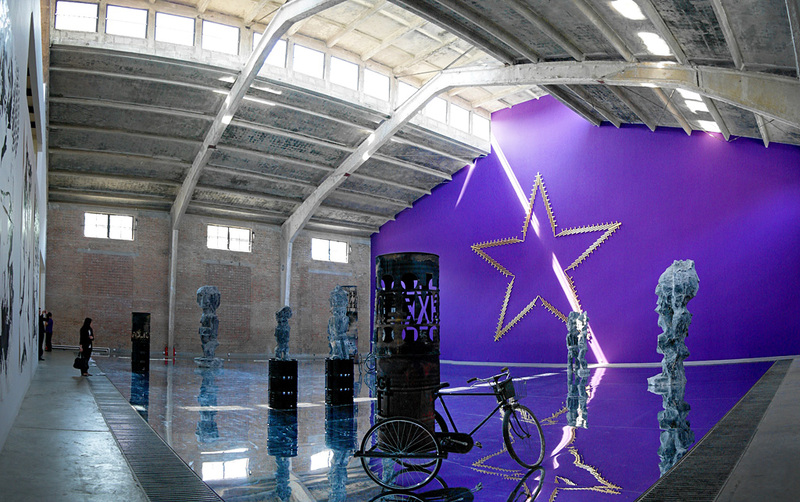 Set against a purple background, it featured a large star formed out of police batons painted in gold leaf. A panoramic view of Beijing 798. Obviously, this is only a small part of this mega art destination. Getting lost is part of the experience at 798. Exhibition after exhibition. Gallery after gallery. Your world could easily go topsy-turvy after a while. Huang Yongping's “Leviathanation” - a huge fibreglass fish head mounted on a replica of Mao Zedong’s private train. Internationally renowned contemporary artist Yue Minjun's "Backyard Garden". Well, if you have heard of neither Yue Minjun nor Huang Yongping, it's probably time to open a new tab and Google. Pace Gallery housed in a beautiful Bauhaus-style factory. The bright and magnificent interior of Pace Gallery. An exhibition paying tribute to the iconic fashion designer Diane von Furstenberg. Ok. Enough of art and back to the city. Glimpses of Rem Koolhaas' CCTV headquarters while on our way back to the hotel. It's also more affectionately known as "big boxer shorts" by the locals. After 7 days of art gallery hopping, I took the opportunity to extend the trip and spent a few days in the Chinese Capital. After all, this was my first time in Beijing. My first stop was the Beijing Bell Tower. Built in 1272, it was the time-telling centre of the capital during the Yuan, Ming and Qing Dynasties. Located about a hundred metres from the Bell Tower stands the Drum Tower. The entrance to the Drum Tower. Bought a stick of local snack. It wasn't that bad after some deep frying. The only uncomfortable part was looking at these creatures when they were still alive, struggling with the skewer through them (middle picture above). Still reading up and deciding where to go while having my afternoon coffee. Visited the famous Quan Ju De (全聚德) for its famous and most sought after Peking Roast Duck. Here it comes... succulent and salivating. A nice and hot bowl of chicken soup rice noodles to start the day. A panoramic view of the Forbidden City. The grand entrance gate into the Forbidden City. Another panoramic view of the Outer Court in front of the Hall of Supreme Harmony. The incredibly majestic architecture and its mammoth scale was jaw-dropping. Imagine the grandeur in the past when it was still used as an imperial palace. Didn't know that the emperor and his empresses were Caucasians. Brightly painted roof eaves, rafters and beams. Locals by the entrance wall. It's not difficult to imagine how huge the wall is just by looking at the size of its plinth. Intricate painting details on the façade and beams. Ornamental details at the gable ends. Layering of spaces down a corridor. Balustrade details with sculpted rainwater spouts. Copper door handles with intricate carvings. Signs of wear spanning centuries could be seen. Glazed ceramic tile adorn the lintel. On your knees! This is the emperor's throne inside the Palace of Heavenly Purity (乾清宫), which is the largest palace in the Inner Court of Forbidden City. The big plaque hanging above the throne is engraved with four chinese characters "正大光明", which means "Justice and Brightness". The current plaque carries a calligraphy by Emperor Qianlong. Fine hand-painted details on wooden frames, peeling off and revealing hundreds of years of history. Thousands of tourists flock to the Forbidden City everyday. Innovative design of wooden shutters. Hinged on one side along the corridor, it could be raised (in above picture) as shades or lowered as screens to the windows. High thresholds are ubiquitous in the Forbidden City. Out of the imperial palace and back to commoners' life. A barber along the streets, doing his business in an open space. Quite obviously, he didn't seem very happy about being photographed. Exploring the Hutongs in Beijing. Took me a few minutes to figure out in which direction I should be reading. A sad but friendly dog along the streets. Hope he's not ending up on the dinner table. A typical street façade of the Hutong. The old meeting the new. You've got mail. At Hutong Beijing. Another loyal guard dog by the door steps. Locals gossiping along the alleyway. Locals having a game of mahjong in an open park. The streets of Hutong are lined with residences, as well as shops and restaurants. One could walk up and down the streets multiple times and there would always be new discoveries. A grumpy old lady who wasn't too happy after the photo was taken. Looking out from the EDB Beijing office at China World Tower into the hazy Chinese Capital. The St. Joseph's Cathedral at Wangfujing, Beijing's famous shopping street. What is Beijing tour without visiting The Great Wall. Decided to visit the Mutianyu (慕田峪) section of The Great Wall. Although further than the more popular Badaling (八达岭) section, the long 1.5hr private car ride from the Capital was definitely worth it. Looking through an opening in a watchtower into the valleys. The Mutianyu section is known to be one of the best preserved part of The Great Wall. Compared to Badaling section, Mutianyu is usually less crowded. An ideal spot for photo enthusiasts. 22 watchtowers stand along this stretch of the Great Wall. Despite its majestic solid mass of 7 to 8m high, 4 to 5m wide on top, the Mutianyu Great Wall drapes gently like a tiny silky ribbon across the mountains. Back to the city. Visited Sanlitun Village (三里屯), a popular destination with lots of shopping, restaurants, bars and clubs. Crossing the overhead bridge to Sanlitun Village. The iconic coloured glass façade of Sanlitun Village. Designed by famed Japanese architect Kengo Kuma and Hong Kong firm, Oval. Glass façade of Sanlitun Village shimmering in the evening sun. A visit to the Temple of Heaven, Tiantan (天坛) on the following day. At 38m tall, the Hall of Prayer for Good Harvests is the largest building in the Temple of Heaven complex. Local tourists posing for a photo at the Temple of Heaven. Locals enjoying a game of cards at the Temple of Heaven. A peek of the roof of the Hall of Prayer for Good Harvests. Finely painted roof beams along the corridor leading to the Temple of Heaven. Radiant cherry blossom in the gardens of the Temple of Heaven. A patriotic Chinese boy at Tiananmen Square. Finally, saying goodbye to this magnificent Chinese Capital after a week of sojourn. From the colourful contemporary art galleries to the monochromatic historical Great Wall; from the famed Peking roast duck of Quan Ju De to the wiggly fried scorpions at Wangfujing, this was a short but truly rewarding and memorable trip - not forgetting the art lessons and a quick glimpse of Chairman Mao in his crystal coffin.